Steel Cut Oats Quinoa Gravel Granola with peaches. Steel Cut Oats Gravel Granola is chock full of healthy nutrients. 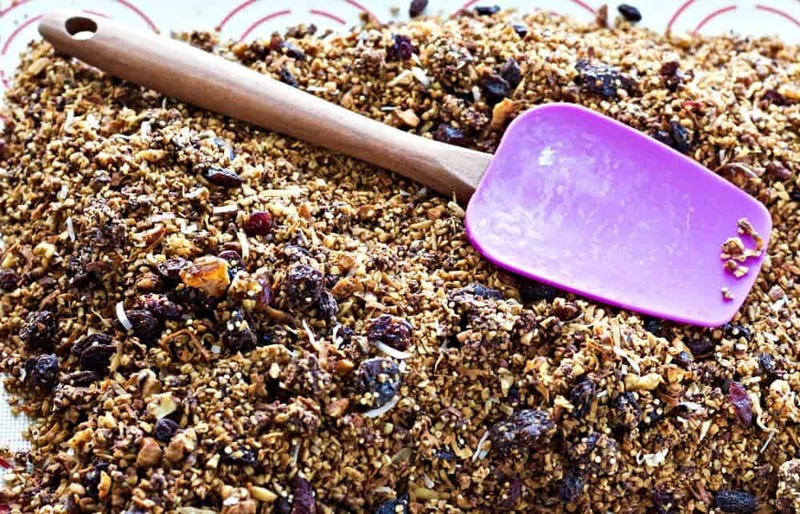 Enjoy this easy to make, Healthy, High-Fiber, Low-Sodium, Vegan, Vegetarian, Dairy-Free, Gluten-Free, Gravel textured Granola. I absolutely LOVE using organic. quick cooking steel-cut oats for my granola base. I’m using Bob’s Red Mill(not a sponsored post). To me, they make the perfect consistency and texture for a granola. Chewy but not tough. Springy actually. They have a nuttier flavor than regular oats that I prefer! This is my third granola recipe using steel-cut oats. Healthy Steel Cut Oats Granola, and my original Steel Cut Granola are also both excellent granola! If you like your steel-cut oats cooked, try Cooked steel-cut oats with Maple syrup. apples and pecans. That’s a scrumptious healthy breakfast too! 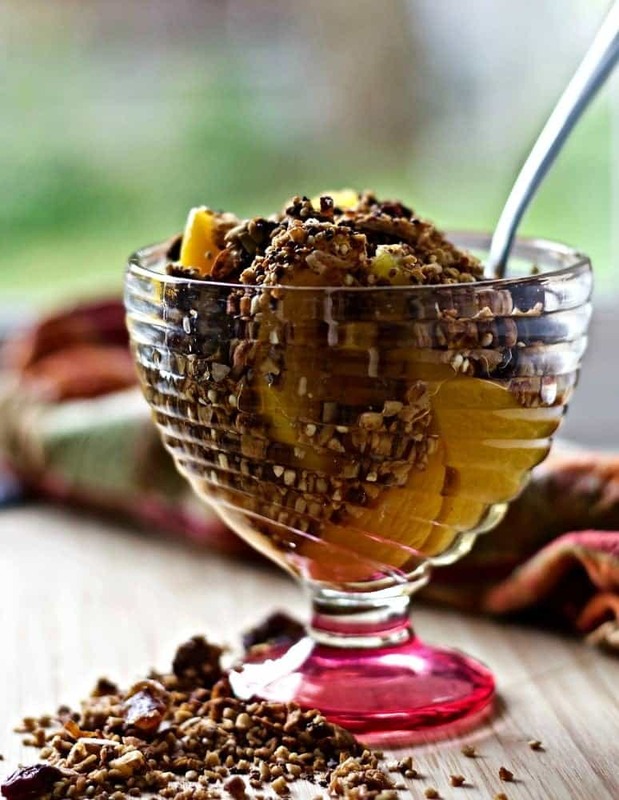 Chia is also a favorite granola ingredient. Lots of nutritional bang per calorie and a little seedy pop in the mix! Quinoa is new to my steel-cut oats granola. And I love it in there!! Quinoa is so healthy and toasts up just fine with this mix. Quinoa is so CRUNCHY! It adds just the right bit of crunch to the seed popping chia and chewy springy steel-cut oats. A satisfying foodie experience! Notice the chocolate clusters in the picture bottom. Yummy little bursts of crunchy sweet! The amber chunks are Medjool Dates. 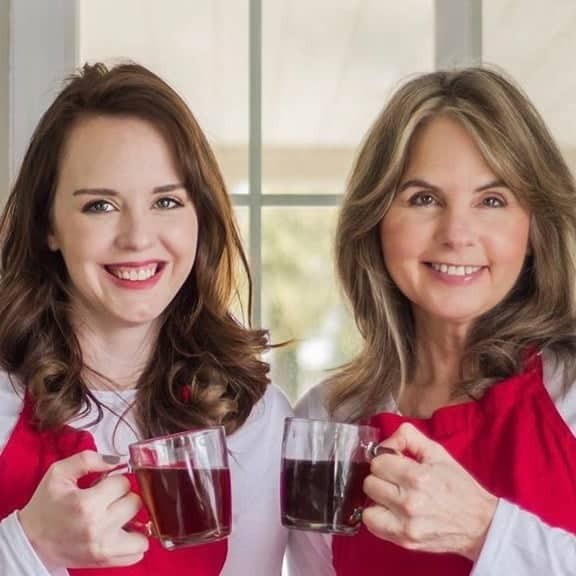 A healthy sweetener! Steel Cut Oats Quinoa Gravel Granola Recipe is a tasty, crunchy granola that resembles a gravel driveway in texture. Loose and bumpy! It’s full of healthy oats, and seeds, like chia and quinoa. Walnuts and coconut oil offer healthy fats. Dried fruits and Medjool dates make healthy sweeteners. The Dark Chocolate is just for fun. But full of antioxidants if you use the high quality 60 percent or more chocolate! 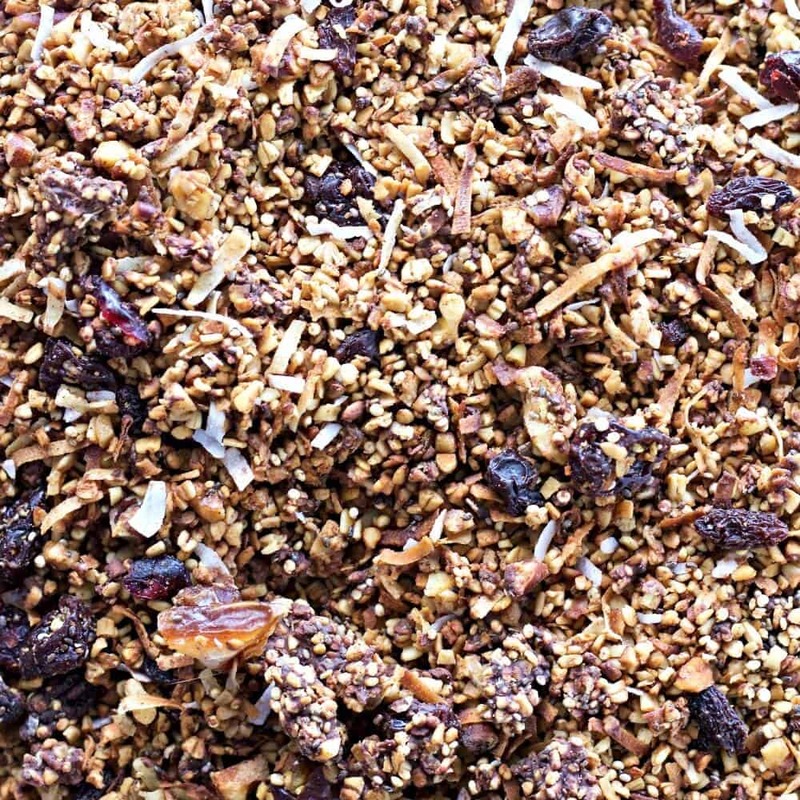 Together these ingredients make a base for a powerfully healthy granola! 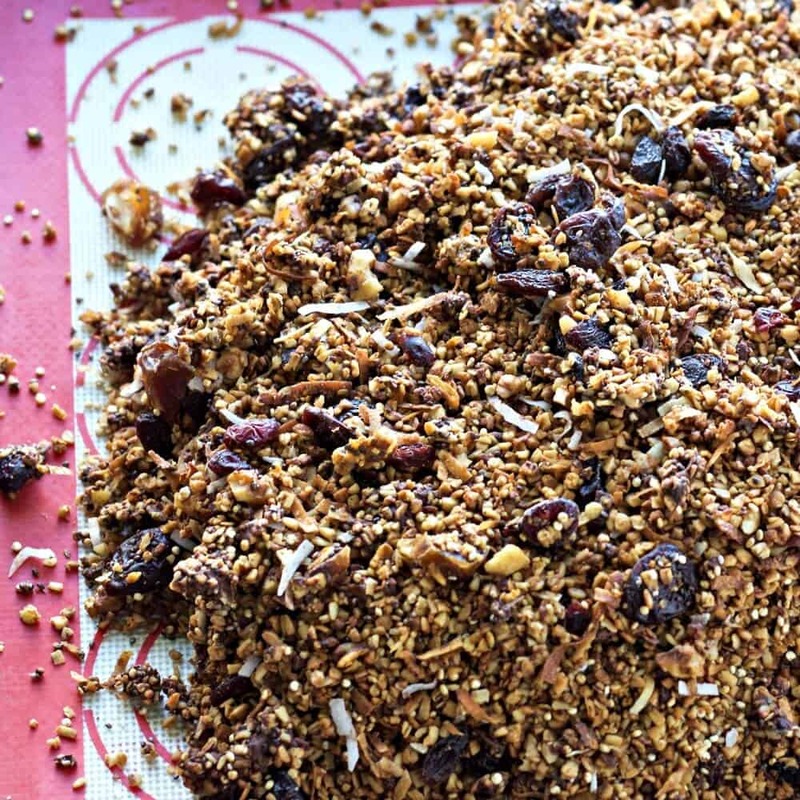 This is a flavorful, slightly sweet, crunchy granola with a TON of uses! Lately, I’ve been feeding Ellie, the one year old, vanilla kefir in her breakfast bowls with this gravel granola and blueberries. She loves it!! Dave and I enjoy a dessert of canned peaches and Steel Cut Oats Quinoa Gravel Granola. 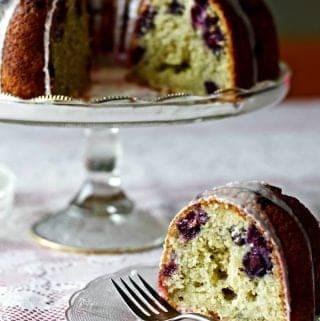 A satisfying, tasty and healthy dessert! 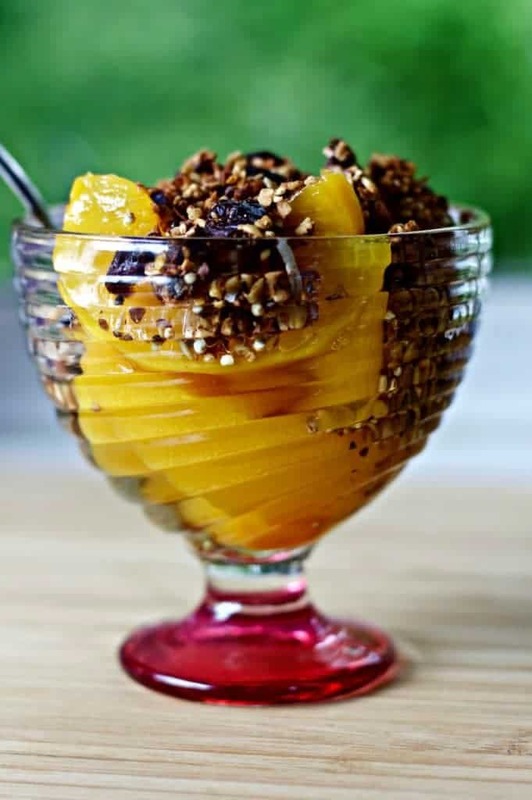 Steel Cut Oats Quinoa Gravel Granola makes a great dessert with canned peaches! This recipe uses molasses for sweetener. I highly encourage you to use it instead of brown sugar. Molasses is actually good for you and tastes great in this recipe. When blended with Pure maple syrup, as I did here, molasses is about as sweet as regular sugar and much healthier. Melt the coconut oil and other liquids(except vanilla) together in a 4 cup glass measure in the microwave for one minute, or until the coconut oil is almost melted. 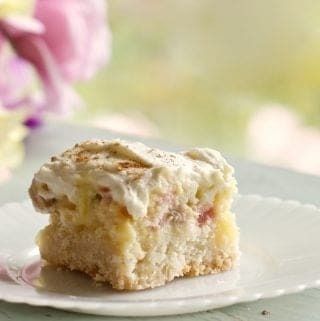 Add vanilla, Stir it all together and pour it over the dry ingredients in the big mixing bowl. Spread evenly onto two greased cookie sheets. Bake at 325 for 20 minutes. Stir the granola and bake another 20 minutes. Stir it up again. It might still be a bit moist and steamy, but it should be starting to brown. Pour it back into your large bowl. Add in the dried fruits and stir. Add the chocolate and stir it throughout the still hot granola.DO NOT OVER STIR! You want the chips to make clumps. It will melt into the granola as it cools, forming little lumps of seed and oats encrusted chocolate clusters. Yum! Store in an airtight container and cool it down before eating to avoid a chocolate smeary mess on yourself or your kids! This is a loose granola with a springy,slightly chewy texture. It’s very pleasing and satisfying! 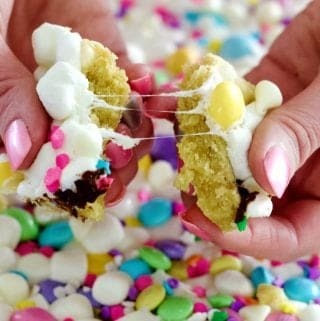 Add vanilla, Stir it all together and spread onto two greased cookie sheets. Pour it back into your large bowl. Now add in the dried fruits and stir. Now add the chocolate and stir it throughout the still hot granola. It will melt into the granola as it cools, forming little lumps of seed and oats encrusted chocolate clusters. Does the quinoa go into ingredients toasted and pre-cooked or toasted only? I just put all the ingredients together and toast it, Quinoa and all. 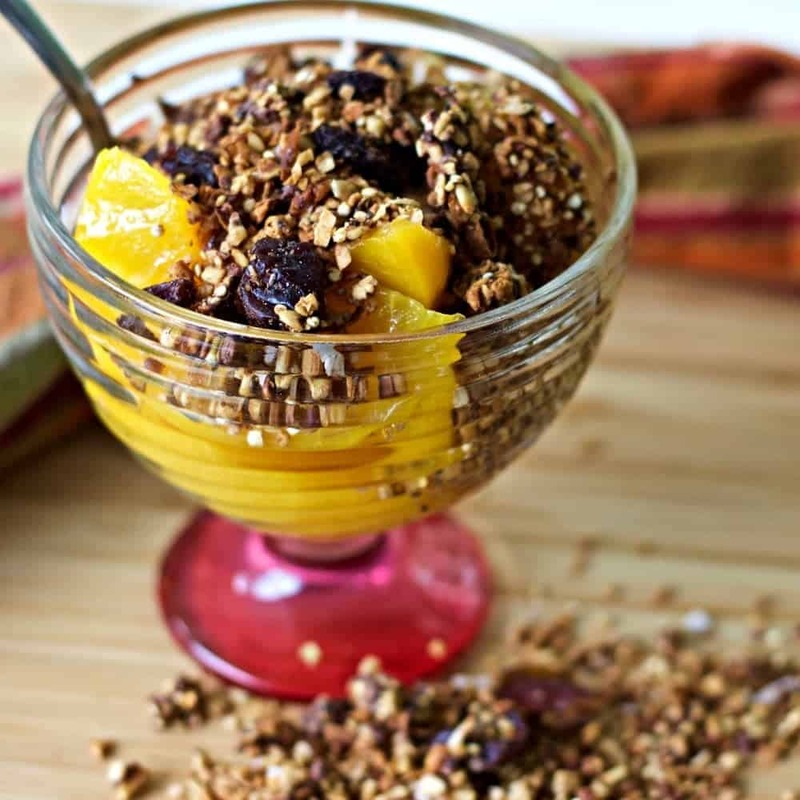 The unsweetened coconut flakes will be a great addition to this granola! I’m so glad we can be of help to you while you battle through this awful illness. Best of luck! let me know if you have any further comments or questions. We love to hear from you 🙂 Have a great day and enjoy this granola. It’s one of my favorites! I will be sharing this one, granola with Quinoa! One of my favorite ingredients, I love how good of a protein source it is! Thank you so much Sara! This is such an excellent granola. I have a batch on my counter right now. My family loves it for breakfasts and snacks. It makes great smoothie bowls too! 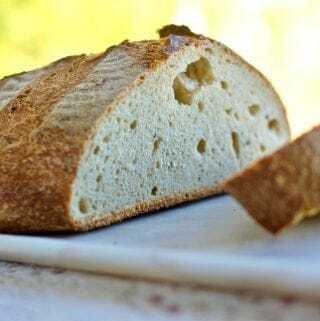 I really appreciate you sharing this recipe!